On the morning of December 19th my Mother-In-Law woke up with what everyone thought was the flu, the evening of December 20th she passed away in hospital. She was a healthy and young 56 year old wife, mum, nanny, daughter, sister & friend, whose life was taken by Sepsis. A life threatening condition, which attacks the immune system, that turned our whole families lives upside down in 24 hours. So far, in memory of Janet White, our family and friends have raised an amazing amount of money for the UK Sepsis Trust. So I thought… What can I do? Just days after her funeral I went out for a run on a snowy February evening and just couldn’t stop. To get out and grieve on my own I guess so I could return home to keep ‘normal life’ in place for my family. I’m an ex-dancer, chubby Mum of two and not a ‘runner’ in any sense of the word! However, I impulsively signed up for the Royal Parks Half Marathon on the 14th October. I’ve slowly and steadily been training since. Every time I step out of the door I’m thinking of Janet, my father-in-law, my husband, his sisters, their partners who, like me feel so helpless and lost seeing them hurt so much with grief in their lives and trying to cope and adapt to such a fast and unfair loss. Then there are 6 beautiful grandchildren. 5 of them finding their own way of missing and remembering their Nanny… and most recently one precious little girl, Ivy, born in August that will never get to meet her Nanny but is a little ray of hope and new life in our family. However… we are all working hard to keep her memory alive personally and through fundraising with the UK Sepsis Trust to try to prevent others from the suffering we have endured. Help survivors with life changing disabilities. Support other families dealing with Sepsis. But, most importantly creating awareness, knowledge and hopefully a quicker diagnosis of Sepsis within UK hospitals to provide faster treatment to save more lives. I wouldn’t wish the heartache and agony experienced in our family for the last 10 months on anyone. So…. 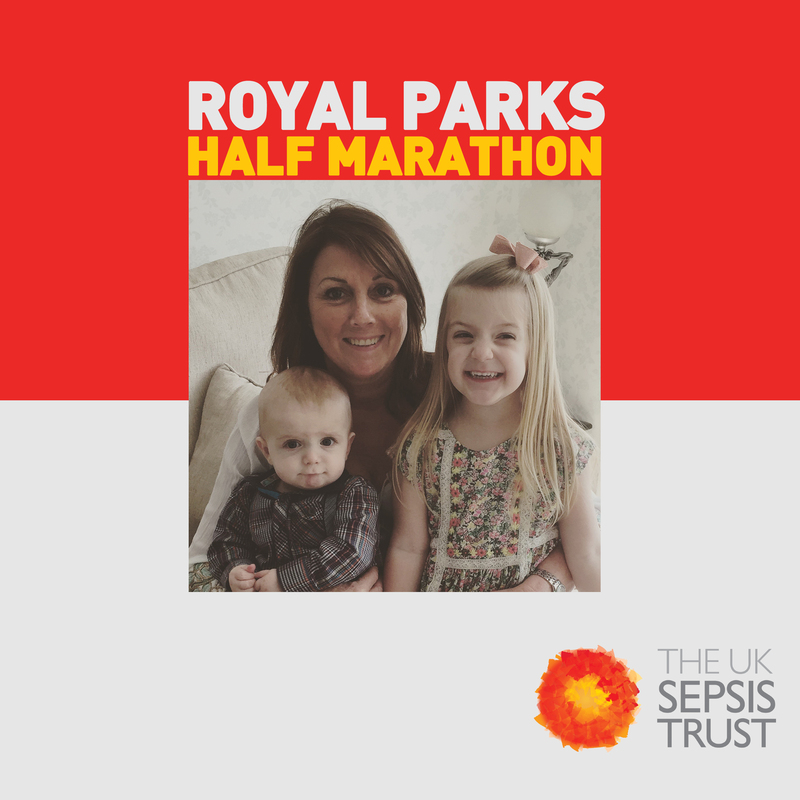 if donations for me running around London helps to raise awareness and prevents another tragic death or supports an individual and family from the long term, life changing effects Sepsis leaves in its path then I thank everyone for every penny so far. I will be wearing my vest with pride but sadness that she isn’t on the finish line to greet me. Sepsis can develop from ANY kind of infection, and is currently one of the leading causes of death in UK hospitals , currently claiming 52,000 lives (a bigger killer than bowel, breast and prostate cancer combined).